These hanging mason jar lights illuminate my new homemade wooden headboard. I am a hipster cliche. To be fair, it’s not like I don’t already have a ton of Mason jars just lying around. I mean, we drink out of them. I do actually can things, on occasion. 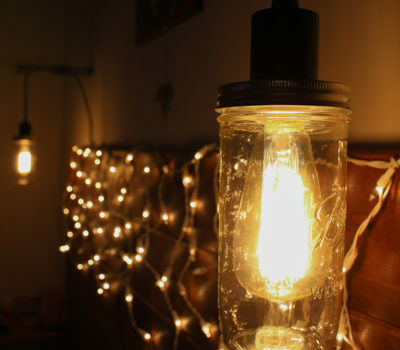 So actually, sticking a light bulb in a Mason jar is just about the cheapest and most efficient lighting solution. I didn’t have to buy a shade or drill out a tea cup bottom or whatever else the cool people are doing (I won’t even Google it, lest I then want to do it, too). hanging lamp cord kit. 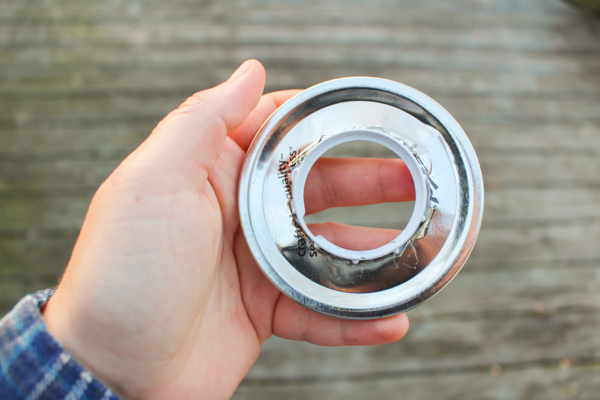 The kind that you need will have a lip that screws off and allows you to put a lampshade on it. Most kits that are intended to be decorative and not, like, a shop light will have this, because most people don’t want to hang naked bulbs from their ceiling. LED Edison bulb. I know you love the look of the Edison bulb. I do, too! But conventional Edison bulbs are huge energy hogs, even hotter and more inefficient than old conventional bulbs. They’re so hot that I don’t even know if it would be totally safe to put one in a Mason jar and then light it up. Use an LED Edison bulb and go frown at all of those hipster restaurants that don’t–they’re heating up our planet! Mason jar. I used a new wide-mouthed pint-and-a-half Mason jar from my canning stash, and an old lid and ring from my non-canning stash. shelf brackets. These are what you screw into your wall to hold a flat shelf from underneath. We found a couple of matching ones in our garage, but if we hadn’t, I’d have checked our local ReStore or Freecycle. tools. Obviously. 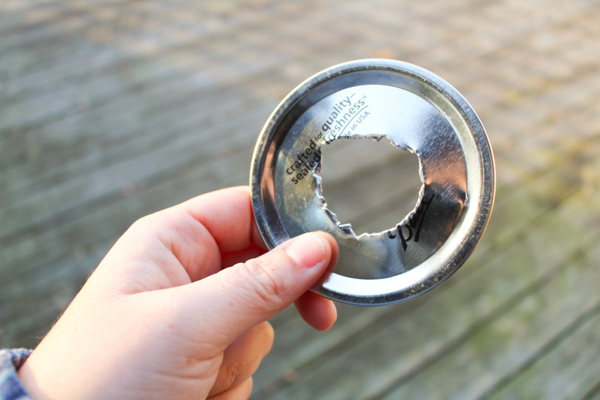 The only weird tools that you’ll need are things that can make a hole in a Mason jar lid. For that, my husband used a screwdriver, a hammer, and pliers, although I really wanted him to use my tin snips or even my Dremel. –but still! It would have been tidier if it had been done with tin snips or a Dremel. 2. Screw everything together. 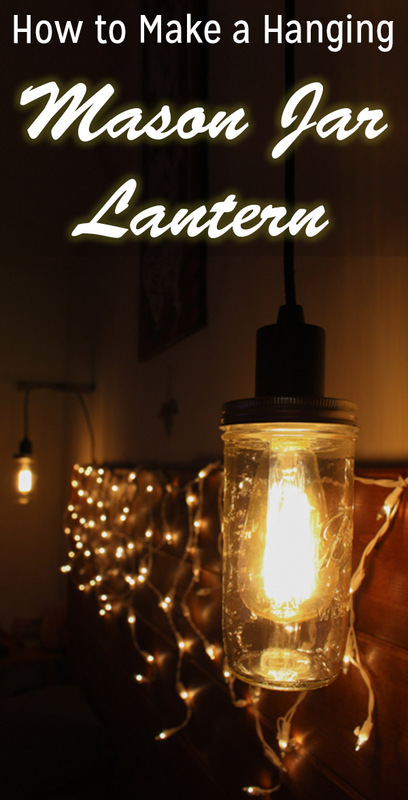 Now you should be able to add the ring for the Mason jar, the socket for the light, and then screw the light into the socket and the Mason jar onto the ring. 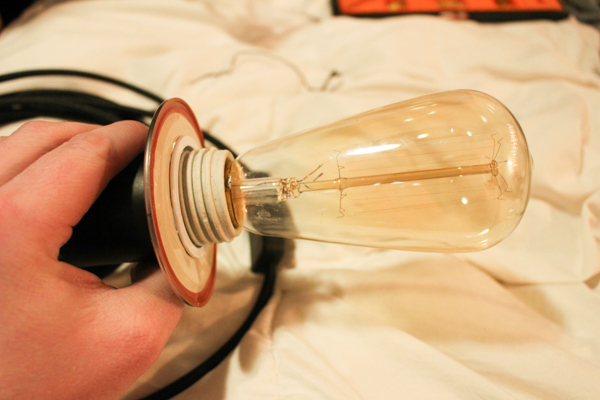 That’s an old-style Edison bulb that I’ve got, before I realized that LED Edison bulbs are a thing. Life is so much better now! 3. Mount the wall bracket. 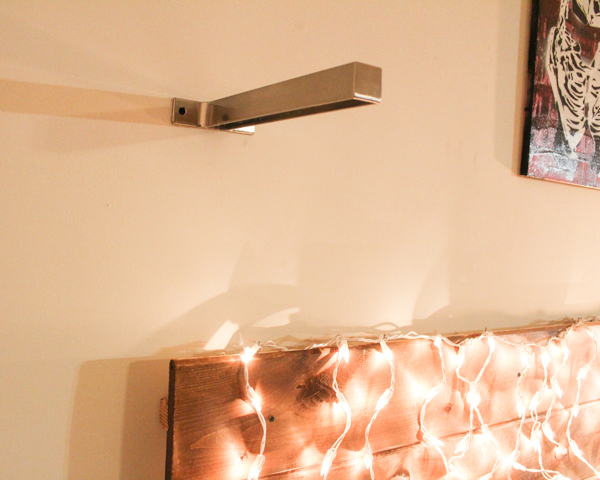 This can go wherever you want your light to hang from, mounted just the way that you would if you were actually going to put a shelf on it. 4. Hang the light. Our particular shelf bracket had a groove in the bottom that worked nicely to hide the cord, but really we just wrapped the cord around the end, adjusted it so that the Mason jar pendant light hung where we wanted it to, and then fastened the cord in place using the magic of zip ties. It’s not a super polished look, but we aren’t a super polished people, and it meets my dual purposes of giving off enough light to read by and looking pretty great. Oh, and it makes me happy.